SEPTEMBER 2018 – ANCHORAGE – The 2018 West Regional Session of the Mayors’ Institute on City Design (MICD) was held in Anchorage, AK from September 5-7, 2018. Hosted by the Anchorage Museum in partnership with Mayor Ethan Berkowitz, the event was attended by Avondale, AZ Mayor Kenn Weise; Idaho Falls, ID Mayor Rebecca Casper; Lynn, MA Mayor Thomas McGee; Parker, CO Mayor Mike Waid; Redondo Beach, CA Mayor Bill Brand; and Union City, CA Mayor Carol Dutra-Vernaci. 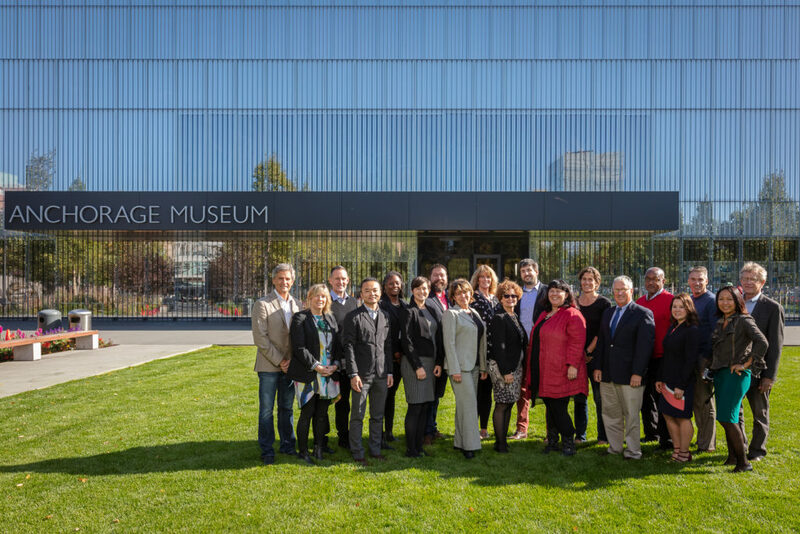 The Anchorage Museum was selected through a competitive RFQ process to host this year’s West Regional Session, in addition to hundreds of other programs and events that take place at the museum each year, many of which have a design focus. With its unparalleled knowledge of U.S. Arctic communities and Native Alaskan heritage, the Anchorage Museum brought unique lessons to participants at this MICD session. Experts in architecture, urban planning, economic development, transportation, real estate development, and urban design from around the country joined the mayors in the two-and-a-half-day discussions and offered pragmatic advice on how the mayors could approach the design and development challenges facing each of their cities. The 2018 West Regional Session began with a bus tour of Anchorage, showcasing a variety of neighborhoods around Anchorage, including the city’s recent work to improve community hubs in underserved neighborhoods. Anchorage Museum CEO Julie Decker and MICD Executive Director Trinity Simons welcomed participants at the opening reception and dinner at the Museum that evening. Mayor Berkowitz, who completed the Mayors’ Institute in 2015, welcomed participants to the Institute with remarks about the responsibility of mayors to design their cities intentionally and thoughtfully. Mayor Waid initiated the discussions the following morning with a presentation on development opportunities along Parker’s Mainstreet corridor. The Resource Team suggested ways to attract the kind of development the community wants, preserving its unique character and building on the momentum of recent planning processes. Mayor Weise followed, eager to hear the team’s thoughts on a proposed civic center project in this suburb of Phoenix. The Resource Team offered ideas for maintaining the area’s current character while adding new capacity for housing and civic uses. Next, Mayor Casper introduced the South Downtown neighborhood and opportunities to make catalytic investments along the Snake River. The Resource Team suggested ways to work with current residents to expand their access to quality open space, while connecting the city to its river and other unique features. Mayor McGee closed out the first day with a presentation on the Lynnway, an expressway that cuts off Lynn from its underutilized waterfront. The Resource Team suggested design strategies for making the road safer and more of a connector than a barrier, while the mayors weighed in on how to move forward politically. To kick off the second day, Mayor Brand presented an overview of a soon-to-be-decommissioned power plant site just blocks from the Pacific Ocean in Redondo Beach. The project sparked a lively discussion about preserving open space and attracting the right kind of development through a community-driven process. Mayor Dutra-Vernaci concluded the Institute with an overview of several key sites available for redevelopment in Union City. The Resource Team dug deep into issues of transportation infrastructure, open space, and housing supply to offer the mayor new ideas and fresh perspectives on the project. Joining the mayors at this session was a distinguished group of Resource Team members: Karen Abrams of the Heinz Foundation in Pittsburgh, PA; Carlton Brown of Direct Invest Development in Brooklyn, NY; Michael Fredericks of RIM First People in Anchorage, AK; Frank Fuller of Urban Field Studio in San Francisco, CA; Vera Mulyani of Mars City Design in Silicon Beach, CA; Drusilla van Hengel of Nelson Nygaard in Portland, OR; and Richard Wilson of Adrian Smith + Gordon Gill Architecture in Chicago, IL. The Mayors’ Institute on City Design is a leadership initiative of the National Endowment for the Arts in partnership the United States Conference of Mayors. Since 1986, MICD has helped transform communities through design by preparing mayors to be the chief urban designers of their cities. MICD conducts several sessions each year. For a list of upcoming events, past participants, or for more information, visit micd.org and follow @MICDdotORG on Twitter.